How does one delete a toolpath, or disable it, using a Mac? Assuming you are using Carbon CreateRight click over the toolpath name then a menu will appear, you can delete, diable, enable, move up down. While it will work with trackpad and 2 button mouse, I suggest using a 2 button mouse with wheel as it is earlier to access all functions. Ctrl + click? Does that work? Do you have a trackpad or is this an old Mac? Some of the Mac mouse and trackpad, there are no buttons but if you press on right you can access the right click menus. I would advise you to get a USB or Bluetooth 3rd party mouse that has 2 buttons and a trackwheel. They are relatively cheap, no need to pay a fortune for one. You use the trackwheel for magnification in most CAD programs and this is very useful and sometimes not possible without the wheel. Hope this helps! 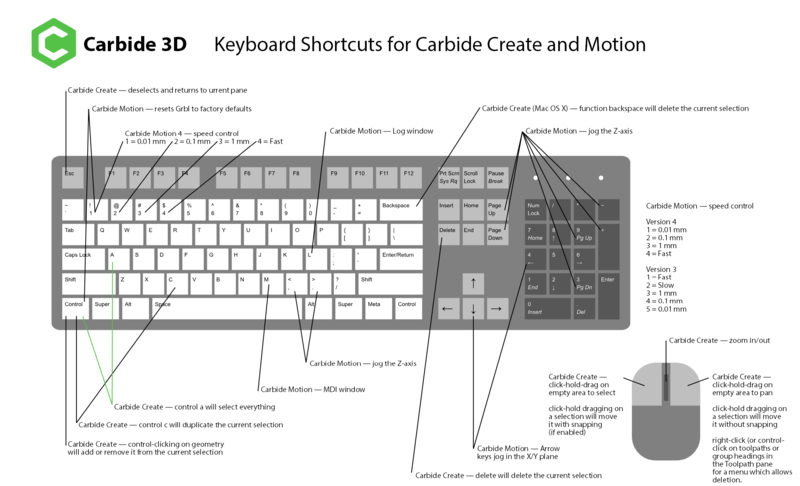 [Carbide3D_create_motion_keyboard_shortcuts] PDF version for printing: Carbide3D_create_motion_keyboard_shortcuts.pdf (467.8 KB) Please let us know of any corrections / additions.